Nature-inspired, this stunning glass accent table lamp features a forest of calming trees and metallic radiance. With a variety of modern details, this accent table lamp by 360 Lighting is great for adding bright illumination. Constructed of glass, the cylindrical shade features an all-around etching of a calming forest. The sleek metal base allows the intricate details to shine and gives this warm decoration its charming personality. Turn on using the in-line switch. Overall: 12 1/4" high x 4 3/4" wide. Bottom base is 5" wide. Uses one maximum 40 watt bulb (not included). Orin accent table lamp from 360 Lighting. In-line switch. Net weight 1.5 pounds. The Metal and Glass Accent Lamp is beautiful! 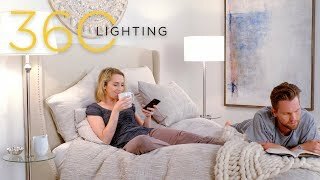 I would recommend this lamp for anyone who wants a little more light but doesn’t have a lot expectations for brightness. It’s a beautiful lamp so I purchased another one because it doesn’t give off much light. More light and a matching pair.